5754 aluminum alloy is a typical alloy of Al-Mg elements with moderate strength, excellent processing performance, good corrosion resistance, weldability and easy forming characteristics. 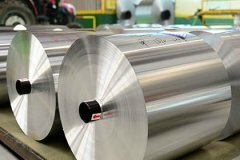 5754 aluminum coil of different heat treatments are the main materials of manufacturing automotive industry (such as car door, mold, seal components), and the canning industry. 1、5754 aluminum coil is widely used for welding structures, storage tanks, pressure vessels, ship structure and offshore facilities, transport tanks. In addition, currently the domestic application of this alloy are various in high-speed rail, commonly used in high-speed rail barriers, sheet metal and internal structure welding. 2、 Easy coloring in post-processing makes it often use to produce high-end doors and windows. For same area, Al-Mg alloy doors and windows are much lighter than other materials. The 5754 aluminum products which manufactured by Haomei has excellent performance, and are widely praised in the doors and windows markets in domestic. 3、 5754 aluminum is also suitable for the military industry of domestic, such as fuel tanks of aircraft.